Yesterday, 1,700 students from around the world enrolled in the first Zapatistas school, held at the University of the People’s Land of Chiapas. 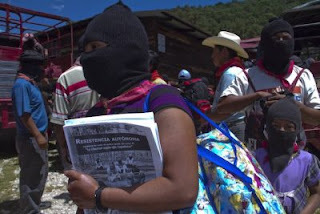 This morning i've been inspired by a new series of 7 essays titled ‘Them and Us’ [original Spanish or English] written by Subcomandante Marcos of the EZLN that lays out the differences between those in power and those who choose to organize from below. 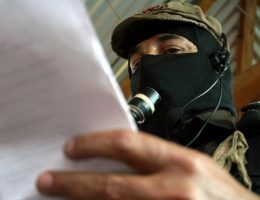 These essays by Marcos are the philosophical underpinnings of a new Zapatista school that opened yesterday [Aug. 12, 2013] at the University of the People’s Land of Chiapas. In the past few days thousands of people from around the world have descended on Chiapas for the Zapatistas’ first organizing school, called la escuelita de libertad, which means the little school of liberty. Originally the group allotted for only 500 students. But so many people wished to enroll that they opened an additional 1,200 slots for the weeklong school. 'Them and Us' was mentioned in the excellent article titled 'The Zapatistas’ first school opens for session' which explains the how the school's revolutionary spirit extends beyond the classroom and onto the broad experience of living, working in the fields, sleeping and eating with Zapatista families of the community that the students are embedded in. My feeble attempts to characterize Marcos' words and the depth of his thought are...feeble. Below is a quote from the first essay as an example, please take the time to read through 'Them and Us' and be moved. And they’re so rude that they don’t beg, await, request, plead — instead, they exercise their freedom. 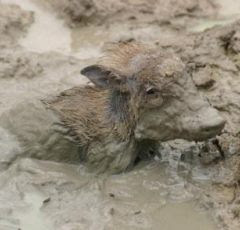 Have you ever seen such obscenity! That is the real danger. Those who look to the other side, who leave the mold, or break it, or ignore it. ...what’s really dangerous in a true chaos is when everyone becomes a collective, group, crew, raza, organization, and they learn to say ‘no’ and ‘yes,’ and they reach agreements amongst themselves. Because the ‘no’ is directed towards those of us who give the orders. And the ‘yes,’… jeez… that really is a disaster. Imagine if everyone built their own destinies, and they decided who to be and what to do. It would be like pointing out that we’re expendable, excessive, that we get in the way, that we’re not necessary, that we should be in jail, that we should disappear. Yes, a nightmare. Yes, of course, for us. Can you imagine how bad that world would be? Full of Indians, blacks, browns, yellows, reds, dreadlocks, tattoos, piercings, studs, punks, goths, cholos, skaters, that ‘A’ flag without a nation to buy it, youth, women, whores, children, the elderly, zoot suiters, drivers, peasants, workers, tacky people, proles, poor people, anonymous people… others. Without a privileged space for us, the ‘beautiful people’… or, so you understand us, the ‘good people’… because we can tell by the way you talk that you didn’t study at Harvard. Yes, that day would be night for us… Yes, everything would be ruined. What would we do?